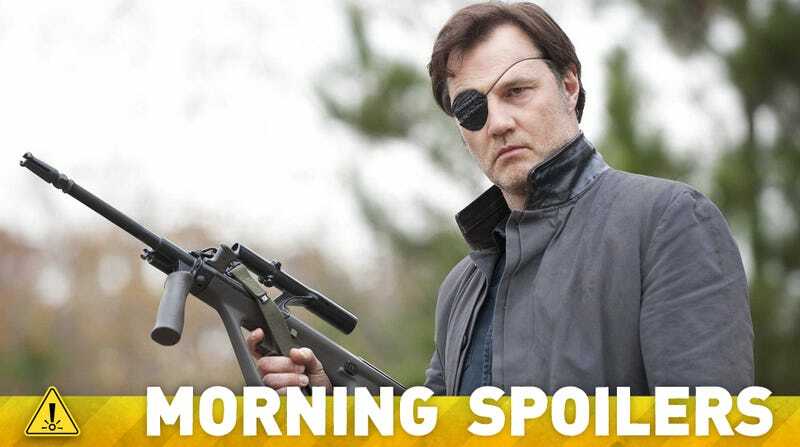 Could the Governor really be returning to The Walking Dead? There's speculation that Dwayne Johnson's playing a role in Batman Vs. Superman, with one guess being pretty logical and another being pretty out there. And why does an Arrow EP think that more comic book adaptations are good for everyone? Plus, new Captain America photos. Spoilers now! Will Khal Drogo join Batman Vs. Superman? Plus a New Godzilla Mystery! We already know the title of the next X-Men movie, coming in 2016! Something happened to him. I feel like a shady politician where I can't confirm and I can't deny anything. Certainly, bad things befell him at the end of the last episode but we just have to wait and see. Juliette's gone from being a somewhat passive character to a very active character and it's certainly been incredibly fun, especially for me and David [Giuntoli], because as actors we are able to do a scene and our characters aren't at each others throats and someone isn't sad because someone's hiding something from the other. They're asking each other for advice and figuring it out together. She's turning into a sleuth which is really cool. This is something that's going to be primarily strengthening their bond because they've spent so long keeping each other at arms length, but now they can go forward as a team. I think all of us here — not just as writers but as viewers — are thrilled that we're in what feels like a golden age of comic book adaptations in both film and television. We're excited to be part of this real shift in the TV landscape that includes S.H.I.E.L.D. and hopefully for next season Gotham and Constantine, and even the Daredevil show, which I'm really excited about.
. . . We really feel like a rising tide lifts all ships,so the more comic book adaptations the better! 1830: Madame LaLaurie, newly arrived in New Orleans, discovers her penchant for cruelty. Today: As the Coven mourns one of their own, Cordelia realizes that her mother needs to be stopped. Meanwhile, The Corporation covers their tracks, as Harrison plans a double-cross. We learn more about Madame LaLaurie's past and present, as she finds her circumstances more and more intolerable. She returns to a horrifying pastime of old that will make the hours bearable for her again... and finds an unexpected ally and kindred spirit, who offers her a chance at getting the one thing she truly wants. As Fiona and the Axeman make plans for the future, Cordelia tries to regain the trust of an embittered Queenie. Zoe and Kyle pursue justice – but they're interrupted by a jealous Madison. Cordelia makes a desperate sacrifice to gain the power she needs to protect the Coven from enemies without and within. Myrtle gives Zoe an unexpected gift to help her and Kyle, though Zoe's not sure she wants it. Fiona and Marie Laveau have a deadly face off with Harrison and The Corporation. And Madame LaLaurie finds that sometimes, you don't get what you want... but you get what you need. 01/17/2014 (10:01PM - 11:00PM) (Friday) : As Mina recovers from her attack, Harker joins The Order Of The Dragon and Grayson goes to war with them. Everything begins to unravel. Browning desperately searches for his children, Lady Jane prepares for the ultimate vampire hunt and Lucy confesses her betrayal to Mina, destroying their friendship and ultimately suffering the ultimate backlash. With all the surrounding chaos, Grayson decides to make a heart-felt confession to Mina.